I guess I forgot to post today yesterday. This will count, anyway. Really, the day ends when I go to sleep, not because the clock happens to pass midnight. I’ll (hopefully, if I remember) post again today sometime after I wake up. Not much to say, which I suppose could be why I forgot to say anything at all. It was a fairly typical day. Went to work, went bowling, went home. Didn’t bowl very well, and for some reason couldn’t concentrate or focus. Not sure why, but it was weird. When I first got home, all I wanted to do was collapse in bed. I did for a few minutes, but then got distracted by a few more things I wanted to do with my intervalometer. The whole thing is now set up on a ProtoShield (with a mini breadboard), which is nice. I did that for a few reasons. One, to make sure I could take it all off the breadboard and wire it up again from my schematic. It’s not a terribly complicated circuit. The other reason was so I could take it home with me when I go to NY this week for Thanksgiving. My father wants to see it. I’m looking forward to the next step, which is designing and etching the printed circuit board, so I can put the whole thing together in a small case and be done. Not that I want to stop working on it, because I’m having fun with it, but I want to be able to take it out with me and use it for photography. That was the point of making it in the first place. Almost forgot to post today. But I didn’t. My plan for today was to continue to work on my camera timer project, play some Gears of War 2, and clean up the mess that is my kitchen. Two outta three ain’t bad. Not on the plan was burning myself on my soldering iron, but that happened, too. It’s making this post a little hard to type, but it’s really not all that bad. My left middle finger got the worst of it, and my left thumb a little bit. It happened because my chair didn’t move the way I expected on my carpet, and I lurched forward badly while reaching for it. Coulda been worse. As for the intervalometer, the software is pretty much done now. I’m waiting on a cheap RF transmitter and receiver, to see if I’ll make it a wireless release as well. That will require more software, but likely not all that much. Also, it would just be really cool. Okay, time to go put my hand on ice again. Yes, yesterday’s Hello, World post counted as a post for the day, even if I didn’t even write anything. I’ve been working on my Arduino interval timer project a lot. Got a bunch of parts and random electronics. Finally got a breadboard. Got the cheap knockoff cable releases for the camera. They’re very good, by the way. Only $6 or so on eBay instead of $45ish from Canon (on Amazon.. MSRP $70! Sick.) It’s just a simple switch inside a simple plastic case… with a proprietary connector. Now, I can set up some variables in the software and get it to take pictures at interval, and set the exposures. The next step is to be able to set those variables from the device. 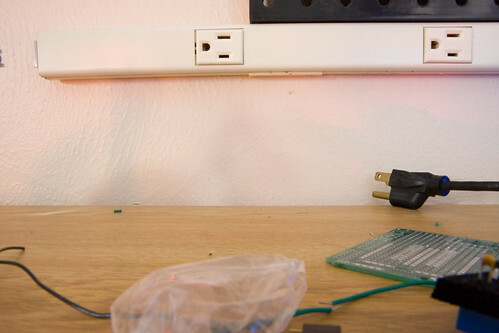 This picture was a 500 second exposure, timed by the Arduino. While the shutter was open, the LCD display was counting down the time left. The lights were off in the room. I got a bunch of my electronics parts today. Still waiting on the cable releases to hook up to the camera, but I was at least able to start playing with some of the other stuff. I got the keypad that will be used for number entry working. Well, I got it to get an LED to do something. It really didn’t take much work, though the library didn’t quite work out of the box. I had to make a minor change to it to get it going, but now it seems all set. This weekend I get to play with the LCD. Also, I think I need to make a trip to Fry’s. It’s been too long since I did a project like this. Gonna be fun. I just bought tickets for the Mets home opener next year, and a plane ticket to NY for it. I spent a little more than I needed to so I could be in the front row of the upper deck. Hopefully, I’ll get a picture similar to the ones I have of PETCO and Dodger Stadium. I’ll be down the first base line instead of the third base line, but that should give a better view of the water. The sunset timing should work out so the game will be on at the right time to get the shot. Also, Citi Field home opener! Ordered a bunch of other random electronics to get me going on my intervalometer project. I think the first step needs to be cleaning my office so I can actually work in it. This will give me an excuse to actually get that done. I’m looking forward to getting all the parts, so I can get started on it. The more I look at what I need to do, the more fun it seems like it will be. The tubes are broken. I can’t get to Google, Yahoo, Flickr… http://internetpulse.net/ shows some connections slow or critical. Looks like some internet backbone is having problems. I can still get to my website, though, so no excuse for no post today. I figured out what my first Arduino project is going to be: an intervalometer for my camera. Similar to this, but the 40D has a different connector than the Rebel line, so it’ll have to be slightly different. Shouldn’t be too hard, though. I ordered a few generic cable releases on eBay… four for $21 here. That should give me enough room to screw up one or two of them. I’m really not sure what I’ll do with it, but it’ll be a fun project that will at least have some chance of getting used. Tubes seem to be unclogged, now. I’ve really got nothing else today, again. Posting every day is difficult. Does anyone else think this is hilarious? What was I thinking making two posts yesterday? If I’m going to succeed in posting every day this month, I probably need to save them up. Today, I’m not really coming up with much to write about. The election is over, there’s no baseball… what am I going to do? Gears of War 2 comes out tomorrow. I’m looking forward to that. My copy is coming from Amazon, with release-date delivery. 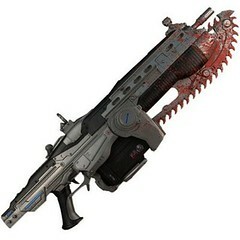 I’m also getting the Lancer because… well, just because. It will arrive sometime next week. I ordered a bunch of Arduino stuff from the Maker Shed. I don’t really know what I’m going to do with it yet, but I want to be prepared for those times I want to make some random electronic thing. 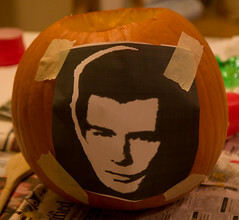 Like a Rickroll pumpkin, for example. I got the idea to order this stuff from my brother. Congratulations to Darren and Lindsay on the birth of Zachary Rhys! There’s some video of it blinking here: http://www.youtube.com/watch?v=6Rd8pvUZAfg. 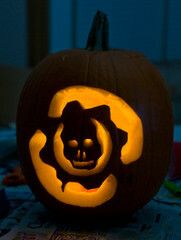 Also, I wanted something vaguely scary/Halloween related, so I made one with a Gears of War logo. GoW2 next week! 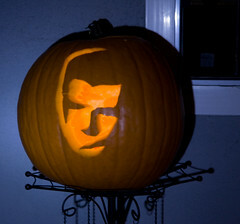 I said I had big plans for another Halloween pumpkin, and those weren’t it. 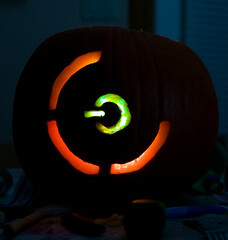 I now present the Rick-ro-lantern. Hm, I may need to work on that name. Video was shot with my Panasonic Lumix DMC-FX37. 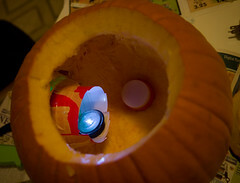 I initially wanted to have the whole thing self-contained, but didn’t come up with the idea in time to do that by Halloween. 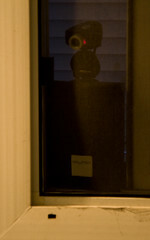 Instead, I decided to put it in front of the window, with a speaker and webcam inside. I used Motion to detect movement with the camera, and then start the song playing. The camera didn’t see anything at all at night (even with the outdoor light on), so I went with the light you can see at the beginning of the video. It’s the only thing the camera can see, so when someone walks between it and the camera, the software sees it as movement. 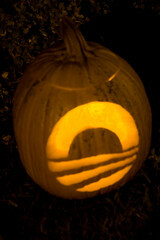 My carving skills are fairly lacking, but it came out well enough, I guess. Need practice. You can see all the pictures, with a little bit of explanation on some of them, in the flickr set: http://flickr.com/photos/penner42/sets/72157608232548269/. 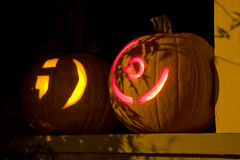 The Red Ring of Death pumpkin has been getting a lot of attention. It was linked on DVICE, and then picked up by Gizmodo. It’s got a blinking red light inside. I want to fix it to make the middle part of it green, like it’s supposed to be, but I’m not sure I’ll be able to do it. I think the funniest part of this whole thing is that a few people on Giz think they’re not real, that they’re photoshopped images. 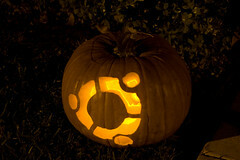 The others are an emoticon (“Bob!”), the Obama logo, and yes, the Ubuntu logo. I also got an email from a reporter at a news service who wanted to write an article about them. I wonder if anything will ever happen with that.